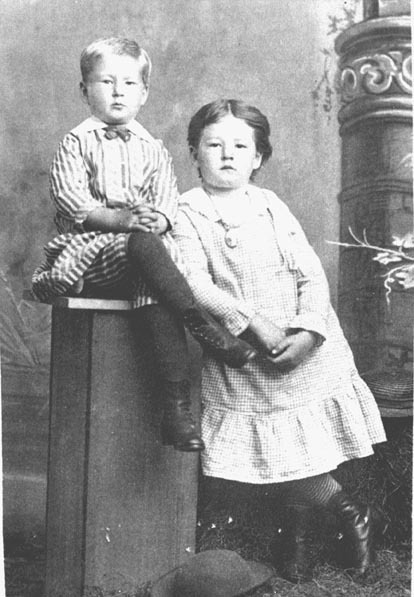 PER GUSTAV & NANCY LEANORE (VAUGHN) HINDORFF. Gus recorded his diary of the trip in a small pocket-size notebook, and Leanore recording hers on two pages of stationary from their business in Lewis, Iowa. I have attempted here to reproduce their journals entries, including original spellings, so that it reads much as they wrote it in October, 1883. 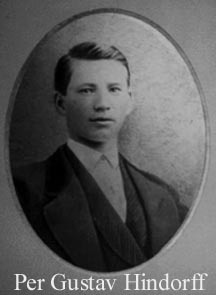 "Gus" immigrated from Stockholm, Sweden in 1868. He had attended school in Sweden and then later in Chicago, Illinois & Iowa of the USA. He had become a Naturalized citizen by virtue of his father obtaining his American Citizenship in 1875 in Illinois. He would have been considered an "educated man" in his day. Leanore attended school and was a school teacher in Iowa. Cass County lies in the southwestern part of the State of Iowa. The early arrival of settlers was slow but constant. Soon cabins dotted the prairies in all directions. Many of the first settlers brought their goods by oxen from Rockport, Missouri about 125 miles away. The journey took about three weeks. Cass County was organized on the first Monday in March, 1853. It was named after Lewis Cass. The county commissioners were given their first task of selecting a location for the county seat. They chose a site which was one mile from Indiantown and laid out the town of Lewis as the new seat of government. 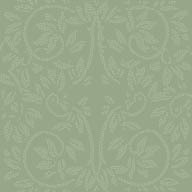 (read about the Jeremiah BRADSHAW & Amos F. VAUGHN of Cass County, Iowa). Most of the businesses and settlers moved from Iranistan and Indiantown shortly after the Lewis town plat was laid out. A frame courthouse was built in 1856, with a small stone building erected in 1864 to house the treasurer's office. In May of 1855, the Western Stage started running four-horse coaches from Des Moines to Council Bluffs. The coaches crossed the Nishnabotna River going through Indiantown and Iranistan before continuing on to Council Bluffs. New settlers continued to arrive and by the first census of Cass County, taken in 1856, there were 815 persons in the county (448 males, 367 females). In 1857, the railroad lines were laid through Cass County, Iowa. 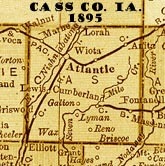 The Rock Island railroad came to Cass County in 1868, with Atlantic, Cass County, Iowa being the stopping place in Cass County. With the arrival of the railroad, Atlantic became a fast growing town. The county seat was removed from Lewis to Atlantic on October 20, 1869. The first courthouse built in Atlantic was completed in 1872, being replaced by a new courthouse in 1882. Abt. age 17 -1873 Chicago, IL. Photo taken in ~1885~ California. Leora was born in 1881. 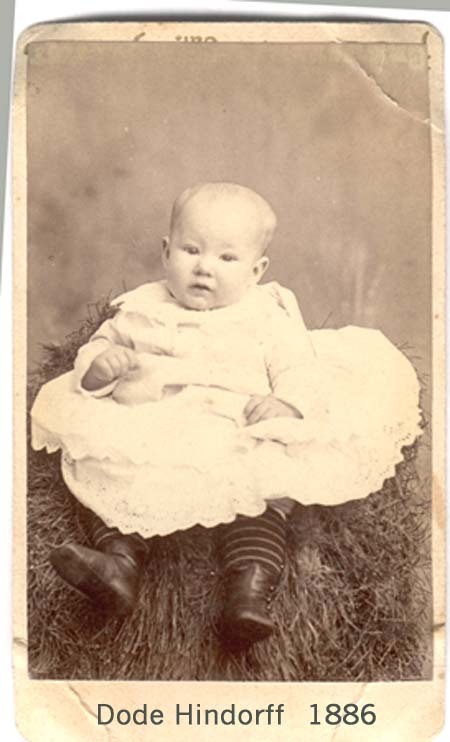 Eric was born in 1883, at Lewis, Cass County, Iowa. "ALL Aboard!" A train bell like this one was mounted on top of the train engine. When about to depart, the engineer would signal by ringing the bell, letting the conductor and passengers know it was time to board and take your seat, or those on the platform to stand away from the departing train. It could be heard from a great distance away. Sitting about 5 feet up off the ground, the panoramic views through the passenger seat windows would have been really something to behold, and at the racy speed of 40-60 MPH, you were nigh onto FLYING! You can almost feel what it was like to be flying & bumping along the tracks inside one of these old beauties. "Clickety click, clickety clack, bumping along the railroad track." finally got quiet about 3. Rained all the latter part of the night. no timber of any kind in sight. - first electric lights since I was in Chicago. 12. & promising snow for all Day. Engin a total reck & some front cars. Carbon (coal) freight-cars piles and b---th (-------) of(f) the track. -snow all gone ecsept on top of mountain. Arrived at Ogden @ 2:30 a.m. C.
passed it by night although it was in moonlght. Arrived at Wells, Nev. this eve. =Mountin in the valley of the Humbolt. through some fine grazing country. Passed through Humbolt this eve. of Sulpher which came from the springs at this place. seized to be a Outting.]??? of Most business like I have sean on the rode (road). River in the Reno, Nevada in mountinous. sayrd (stayed) about a hour for dines (dinner). took supper att Blue Canion & a blue loocking place it is. to sick from Cape smoke to pay much attention. =House & left Docking (----er) for Lathropp. at 4:20 ("After" crossed out) Morning. A lively Irish Folk Tune, played at many a dance back in the day.